Unfortunately I must write to you regarding the same issue again. On Sunday, my team again held Queensland’s largest regular automotive meet at Rocklea Showgrounds. The behaviour of attendees was once again exemplary, with no antisocial behaviour whatsoever. There were no other events anywhere nearby, nor commercial traffic since it was Sunday in an industrial area. Despite that, The Oxley Traffic Branch decided it would be a great idea to take up station at the entry and exit points from my event with 3 separate groups. One of these groups was dedicated to alcohol and drug testing, which I support 100%. The other 2 were vehicle inspection groups, checking modifications. While this may sound appropriate since it involves enforcement of existing laws, I would argue that it discourages enthusiasts from attending a legitimate event, where we are able to enjoy our legitimate passion in a considered, family-friendly, safe way without disturbing or interrupting the wider community. I personally witnessed people being fined for absolutely trivial things. People received fines for inconsequential offences, such as having dark window tinting, missing modification plate for having the rear seats removed (despite the seat belts being present, which I’m advised actually makes it legal), and a steering wheel having no padding. One specific fine that amazed me was a young driver whose P-plate had fallen off the rear of his car on the way to the event (the front plate was still displayed), who received a 2 point, $152 penalty for his “crime”. I’m not sure if those sound reasonable to you, but I don’t think Police were out to “stop crime and make Queensland safer” by removing these dangerous criminals from our streets. Something that sits particularly badly with me is fining people for offences that have no real consequences for anyone but the driver of the vehicle itself. Are we really trying to wrap people in cotton wool to this degree? To what extent do we as a nation want to protect us from ourselves? Shall we ban alcohol and cigarettes while we’re at it, or does personal choice and freedom come into play at some point? Over the last 5 years of running events, we have made inroads to improving driver behaviour, particularly with car enthusiasts. Doing skids outside a car meet is no longer considered cool, and the community itself discourages behaviour like this. 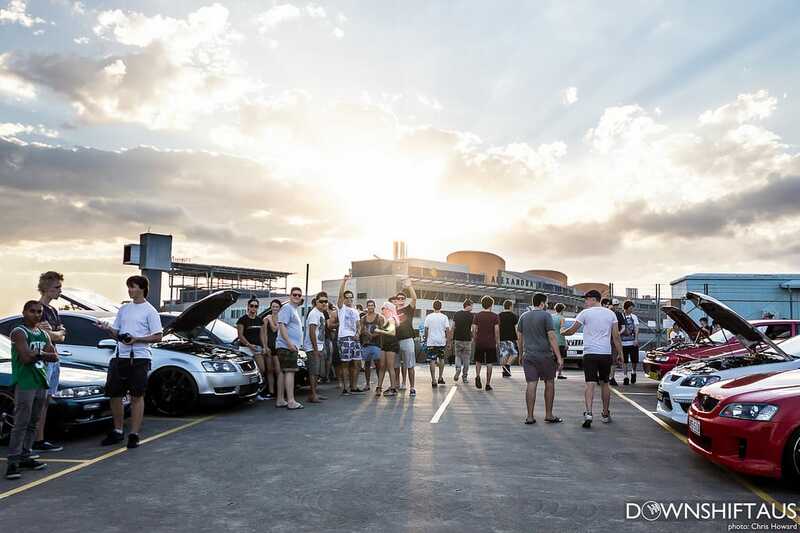 Our ability to continue influencing young drivers in a positive way is significantly damaged by the activities of the Queensland Police, because people simply stop turning up to these properly organised meets, and gather illegally instead. This is not merely an opinion, it directly and quantifiably impacts on attendance at future events and therefore, our ability to positively influence our fan base. We would prefer to work with Police and Qld Transport and assist them in the education of mostly young males, who may not read the NCOP or various other musty tomes of legislature in their spare time. Of course this requires a shift in thinking and taking a collaborative, constructive approach rather than a punitive one. Using the carrot instead of the stick, if you like. Once again we expect there will be significant community backlash, and growing distrust and disillusionment with our law enforcement agencies who are simply interpreting the letter of the outdated and draconian car modification laws. We continue to attempt to improve these relations, but simply cannot do so with these heavy-handed and unnecessary operations. P.S. this open letter and responses will be published on our blog, as well as promoted to our fan base of 350,000 people. Update: 6 March 2015: Since the new Premier has been sworn in, I suspect all of the old correspondence will have been shredded. Therefore, I’ve written again to see if we are able to work together with the powers that be, instead of in opposition. Firstly, congratulations on your election to head the State of Queensland. I trust you will make your mark and improve this great State we live in, despite the difficult problem of balancing the often opposing needs and demands of your constituents. My name is Matyas, and I proudly run a small business and the largest automotive community in Queensland, called Downshift. My team and I run by far the most popular regular car meets, organised properly, on private property, on weekends, as far away from residential areas as possible, with insurance and sanctioned by various bodies such as the ASRF, and have been for 6 years. We have also conducted the largest charity car cruise in the history of Queensland, donating thousands of dollars to Reach Out Worldwide. Whilst we run a professional organisation and are a huge positive influence in discouraging antisocial automotive activities (we’ve single handedly influenced a change in culture where “skids” are frowned upon by the community itself), it’s both inexplicable and frustrating to observe that Qld Police choose to harass our attendees on a regular basis. Even Campbell Newman, the architect of Queensland’s draconian anti-hooning laws agreed that this was unacceptable, however nothing has changed. Of course this type of action also means that people then choose to not attend properly organised events and instead gather in industrial areas at night or race on public roads. We are then unable to influence them to be better citizens on the road. I believe another critical issue is that vehicle modification laws in Queensland are stickling, and Police claim that they are simply enforcing these. As an example, attendees are regularly fined for trivial things such as steering wheels having no padding, battery not being tied down inside the engine bay, window tinting being too dark, car being too low at 90mm height off the ground, and having no modification plate for taking out rear seats. There is no doubt that these things are indeed against the letter of the law, but how much will we wrap people in cotton wool instead of expecting them to take responsibility for themselves? Shall we then create a law for every possible eventuality where people may hurt themselves? Shall we ban motorbikes and bicycles and running with scissors because it’s a risk? We must also question whether fining people for these things is actually realistically protecting anyone. This kind of ridiculousness doesn’t happen in Japan, one of the largest sources of automotive inspiration worldwide. And despite that country being extremely relaxed with vehicle modification laws, their road fatalities per year (4.8) are significantly lower than Australia’s (5.6). Both of these were published on our website, and received a huge amount of both public and media attention. This certainly affects votes, as the majority of our 365,000 supporters are voting public who have had enough of being targeted by small-minded officers from Road Policing Command, who are more concerned with whether a vehicle is 95 or 100mm off the ground than the bigger picture of encouraging a positive change in culture and mindset, so that “hooning” itself is no longer seen as a problem. Reviews current vehicle modification regulations, which are inexplicably included in anti-hooning laws. I look forward to hearing from you, and would welcome any opportunity to assist. I’ve followed up with the Premier’s Office who confirmed that they have received the correspondence (almost 2 months ago), and promise that they will be answering it shortly. 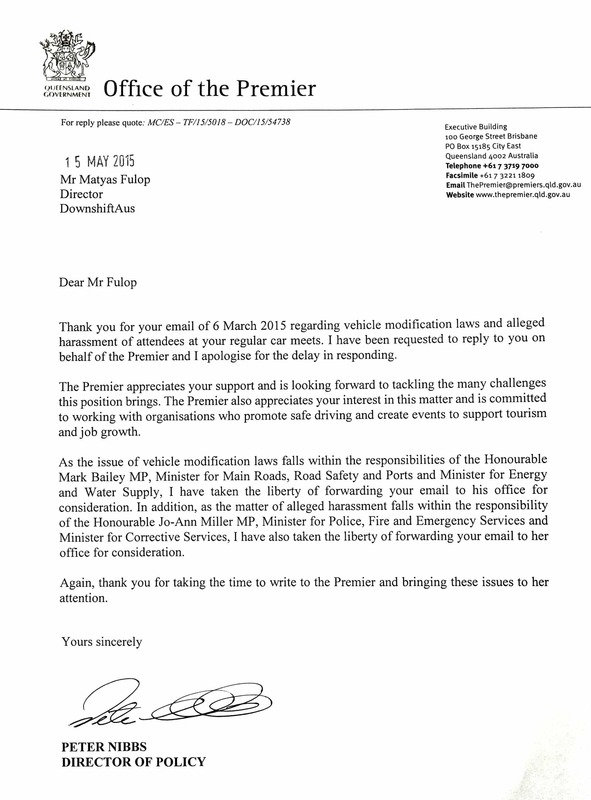 Received a reply from Premiers! Lets see how long the actual replies take from the Dept of Transport and Main Roads and Queensland Police Service.